Vision-Hosting Review 2019: Is Vision-Hosting a Good Hosting? Vision-Hosting stays true to its vision of offering affordable hosting. There’s no free SSL certificate, though. Founded in 2011, Vision-Hosting aims to provide affordable hosting solutions. It also brings reliability into the fold with SSD drives and some premium features. Its services include cloud shared hosting, VPS, and dedicated servers. It is based in the United Kingdom, servers are located in Manchester, U.K., and the website is in English. Vision-Hosting provides security and better performing shared hosting through its use of CloudLinux. What this does is places every hosting client in its own “apartment” and prevents the spread of malware from one client’s space to others. It also ensures that everyone is able to fully use their resources (bandwidth and disk space) without infringing on another client’s. One thing that I like is its provision of Attracta SEO tools. If you’re a beginner to website management and SEO, you’ll enjoy the benefits of this tool. For one, it provides SEO tips that you can use to build traffic. Also, it generates Sitemap.xml and has a section where you can submit it to Google Search Console. This takes the bulk off your shoulders and removes the need for an extra software/plugin. Manually installing software in your cPanel file manager is tasking for the average user. Vision-hosting eliminates that stress for a good number of applications with its one-click installer. 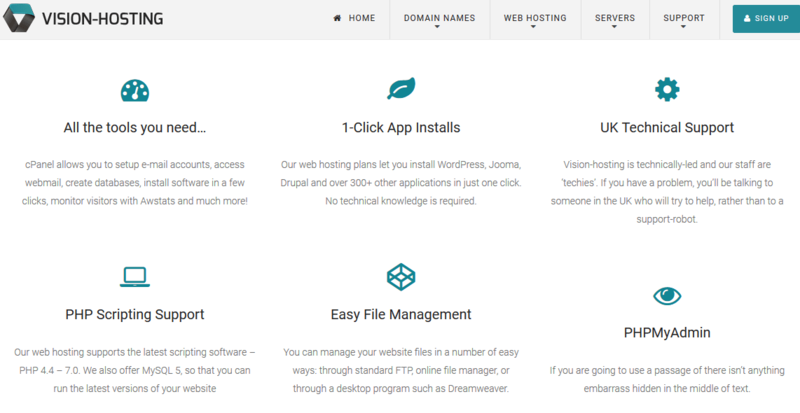 You can use it to install WordPress and Drupal in one click. There are optimized application hosting plans as well (WordPress hosting, Joomla! Hosting, etc.). Vision-Hosting also offers a website builder that you can use to build your website without having to write code. Vision-Hosting stays true to its vision of offering affordable hosting with low-cost plans, and offers free domain registration as well. You can buy one-month, three-month, or six-month plans. However, when you take a year plan, you get two months off. I like that hosting accounts are ready within 55 seconds after payment. That’s quite fast compared to most that provision within five minutes to 24 hours. Although there’s no free trial, this vendor offers a 30-day money-back guarantee. That assures you of lesser-risk because you can get your money back if you’re not satisfied after this period. Vision-Hosting offers 24/7 email and ticket support to customers, though I sent an email and never got an answer even after more than 36 hours. There’s also a support phone number that you can call if you want an immediate response. 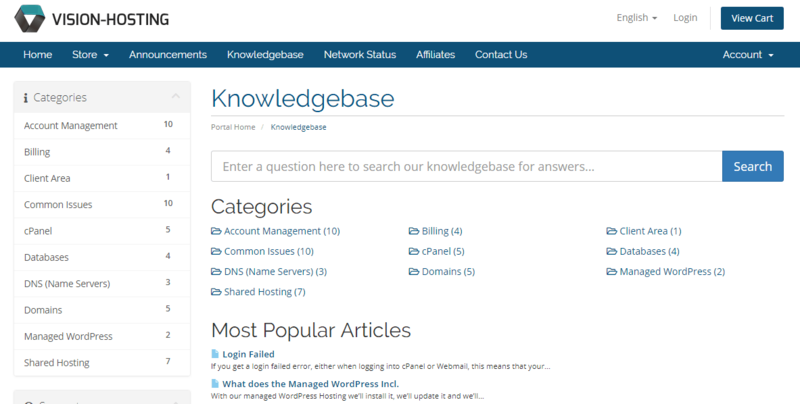 Otherwise, you’ll have to stick with its knowledge base, which has a decent amount of information. If you’re looking for an affordable web hosting plan, Vision-Hosting has some of those. It is not only affordable, but reliable too. However, there’s no free or paid SSL certificate on offer, nor is there Python support on the regular shared hosting plans. Wondering how Vision-Hosting stacks up against other Web Hosting companies? Enter any other Web Hosting company and we will give you a side-by-side comparison.